TigerFlow Enterprise is perfect for leading-edge organizations looking to set a model of performance and innovation for the industry. Enterprise clients enjoy first access to the latest beta technology and can participate in shaping the development of new features before they’re generally available. With TigerFlow Enterprise, we work with you to design, build and support a mobile-centric, custom EHR implementation that maps to your clinical communication workflows. This custom blueprint ensures you maximize patient throughput and streamline your care team’s ability to interact directly with EHR-based patient data in an instant and actionable way. Build care teams around individual patients so all communications, notifications and alerts can be captured in a single conversation thread. Access and interact with EHR-based patient data from within the TigerConnect feed using our EHR Connect standardized HL7 component. Build care teams, manage admissions, discharges, and transfers. Save updates directly to the patient record for more accurate orders, instant lookups and reduced CPOE time for physicians. Link your hospital scheduling system to your pre-defined roles for automated message routing and shift management. Integrate system notifications and alerts from your EHR, nurse call, ADT, LIMS, PACS, and other systems at an advanced level for a 360º view into the patient profile. Route HL7 alerts and message feeds through your TigerConnect instance so critical information becomes instantly accessible in a messaging environment. Automatically route code alerts and nurse call notifications to the right individual or roles, with priority ranking for urgent messages. Access the TigerConnect Desktop faster by logging or badging in with a single set of credentials, saving time and reducing repetitive logins for staff. Receive real-time alerts for system outages and other IT events. Send Broadcast notifications to alert the entire organization or select departments. accelerate care delivery by reducing the steps needed to complete a wide range of use cases. 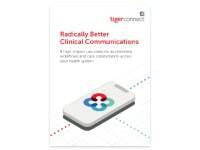 Leverage the components in TigerFlow Enterprise such as the rules engine and intelligent messaging routing to anticipate care team needs and deliver major improvements in critical areas such as wait times, medical errors, and patient handoffs. 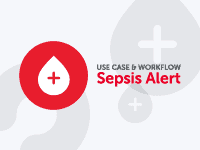 Work directly with one of our clinical experts to design a custom communications map that aligns with your most critical workflows to help reduce steps, improve care, and lower the risk of clinical errors. When it comes to integrating with third-party apps, TigerFlow Enterprise does the heavy lifting. 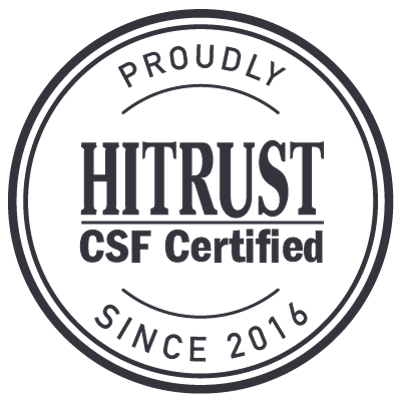 Our product-side components integrate with major EHR and other systems to ease the burden on IT and remove the need for managing updates. No headaches, no added developer cost. Fully-integrated clinical communication solution that transforms your organization through deep EHR integration for world-class productivity and performance, and guaranteed ROI. 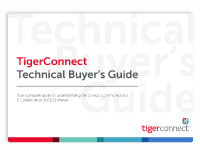 *See yourTigerConnect representative for full details. 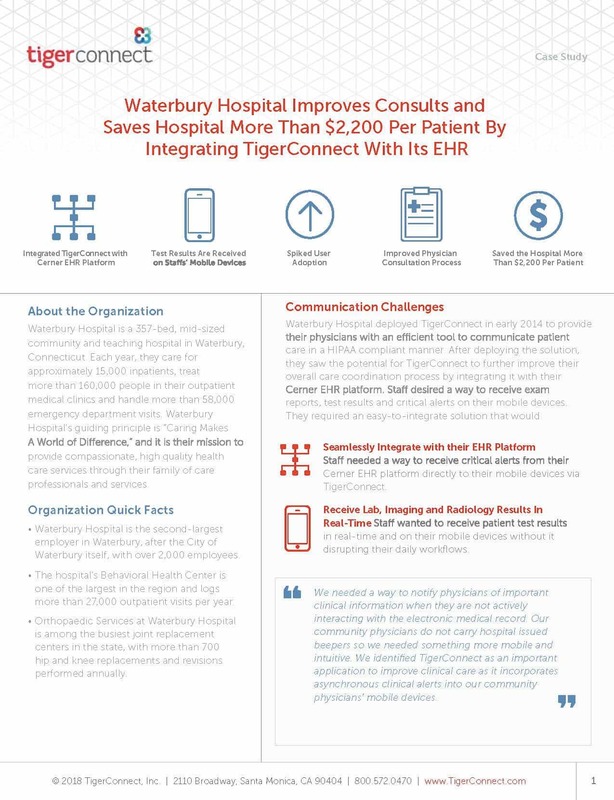 When the Waterbury Hospital staff needed a way to send or receive exam reports and test results, they turned to TigerConnect to integrate with their EHR. Waterbury was able to reduce a patient’s length of stay by nearly two days, helping them save more than $2,208 per patient. Want to see a live demo? Fill out the form below or call us at 1-800-572-0470 to learn how we can improve care quality and communication.